In my previous blog post, I explored the functions of mindfulness and concentration. I described how they interacted and supported one another. There is a wonderful meditation technique that combines these two functions very effectively. 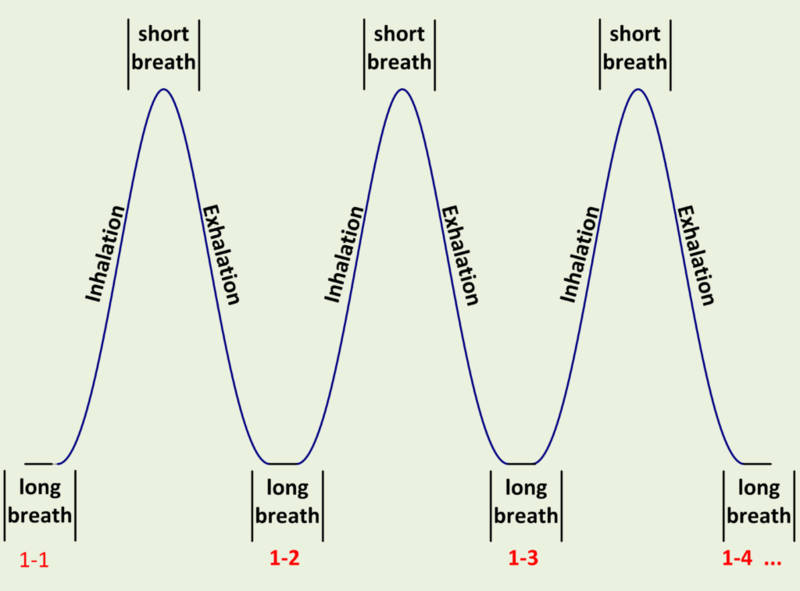 Before I get to the actual technique, it is important to understand the concepts of “long breath” and “short breath” as they pertain to our breathing cycles. Please review the diagram above. Within our normal breathing cycle, a “long breath” is the relatively long space between an exhalation and the next inhalation. On the other hand, a “short breath” is the relatively short space between an inhalation and subsequent exhalation. Long breaths, and by extension, exhalations, promote relaxation of the body. Short breaths, and by extension, inhalations, energize the body. The meditation technique involves counting breaths and placing the counts on long breaths as displayed in the diagram above. It is very important to note that the breath should not be manipulated in any way. You should work with the breath as it comes in and goes out on its own. There is a twist in the way breaths are counted. 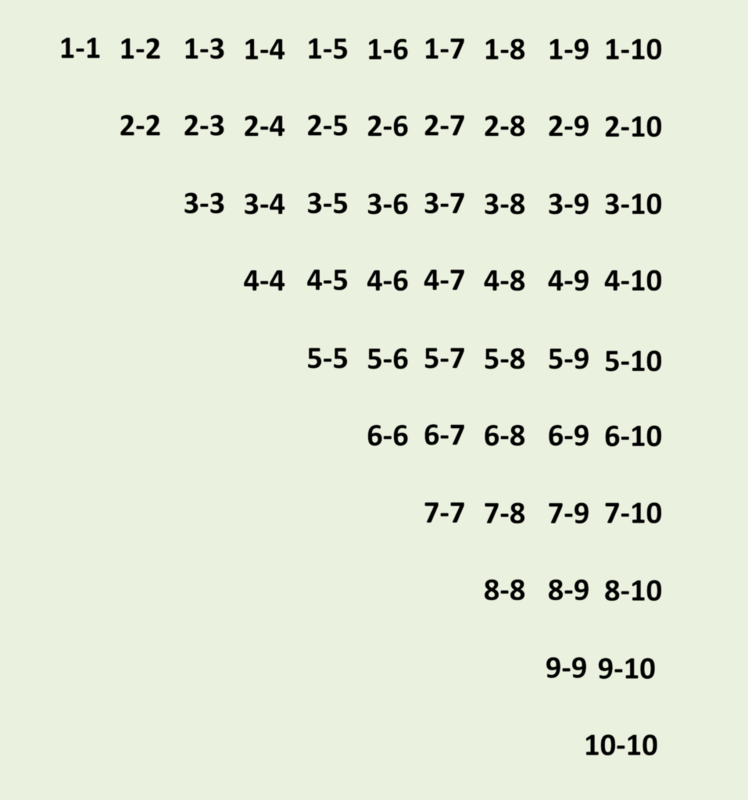 Instead of counting the breaths in a neat sequence, they need to be counted in a pattern displayed below. The pattern starts from top to bottom and from left to right, as displayed below. You need not repeat the numbers as “1 hyphen 1”, “1 hyphen 2” or “1 dash 1”, “1 dash 2”, etc. You can simply repeat the numbers as “11”, “12” and so on. Depending on how relaxed you are during the time of this exercise, you may spend anywhere between 3 to 7 minutes to complete one round of counting, i.e. from 1-1 to 10-10. The more relaxed you are, the more difficult it might become due to the time lag between each breath. It is important to do the count at every long breath in the pattern displayed above. If you miss a count during a long breath, then start all over again. Also, you should count only once and move up the pattern during each long breath. I love this technique because the effort involves both mindfulness and concentration in an even and delicate balance. If you are really good at this exercise, then try doing two rounds one after the other. In other words, do one round from 1-1 to 10-10 and then repeat it all over again. It is important to not force yourself to do this exercise. You should be as relaxed as possible while performing this meditation because the breath should come in and go out on its own. Tightness or anxiety will speed up the breath but it will work against you.